A couple weeks ago, I was asked to sit in on a panel reviewing and critiquing undergraduate design students’ visions for the future of Los Angeles transportation. The location was Otis College of Art and Design, located near LAX. 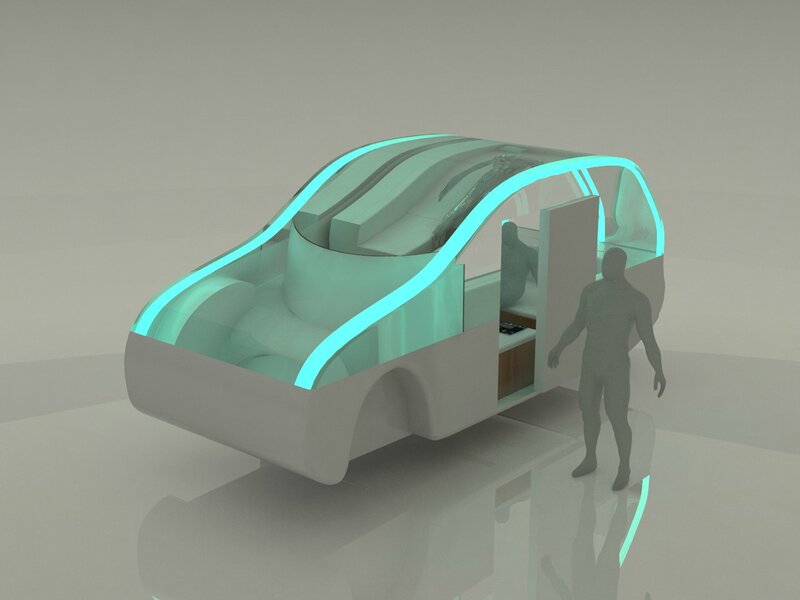 Lecturer and Architect Matt Gagnon had given his product design students a simple, but far reaching, assignment: design for the future of mobility in L.A. The students, working in teams, took things in varied and interesting directions. I didn’t find them all to be things I would run out and push for tomorrow… but they are nonetheless thought-provoking fresh looks at issues that Streetsblog tracks. Here’s round two of the critique: readers, what do you think? Comment below. 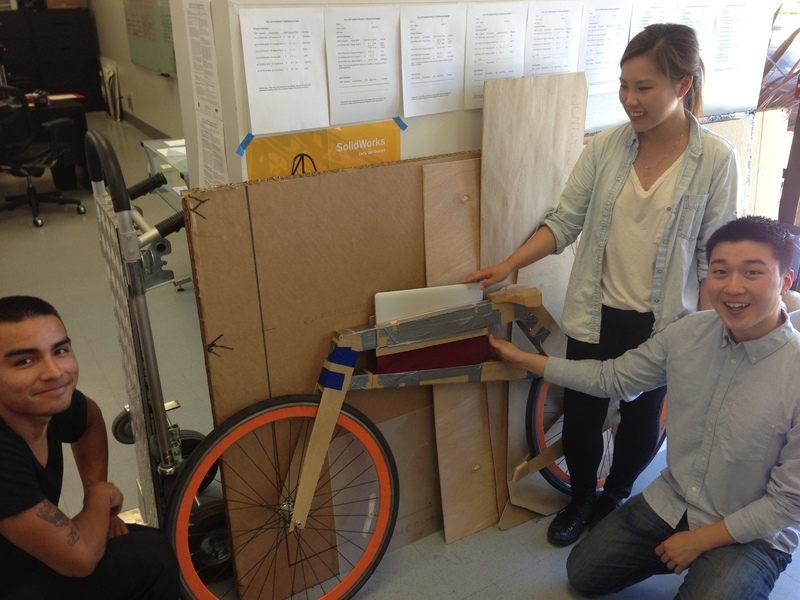 These young designers feel that the old-fashioned bicycle could use a second look. They’ve come up with a new frame geometry that they think would be both exciting (think sports car) and useful for transportation. The Evolu design team with their prototype frame. 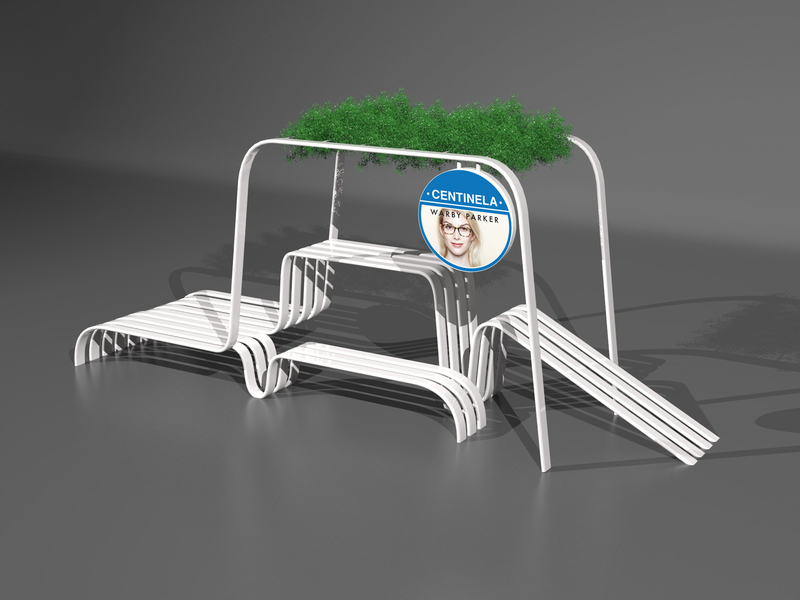 The proposed design would include built-in special features: Jenny Lee demonstrates a slot in the frame where riders can carry their laptops. Photo: Joe Linton / Streetsblog L.A. The team built a life-size cardboard prototype. 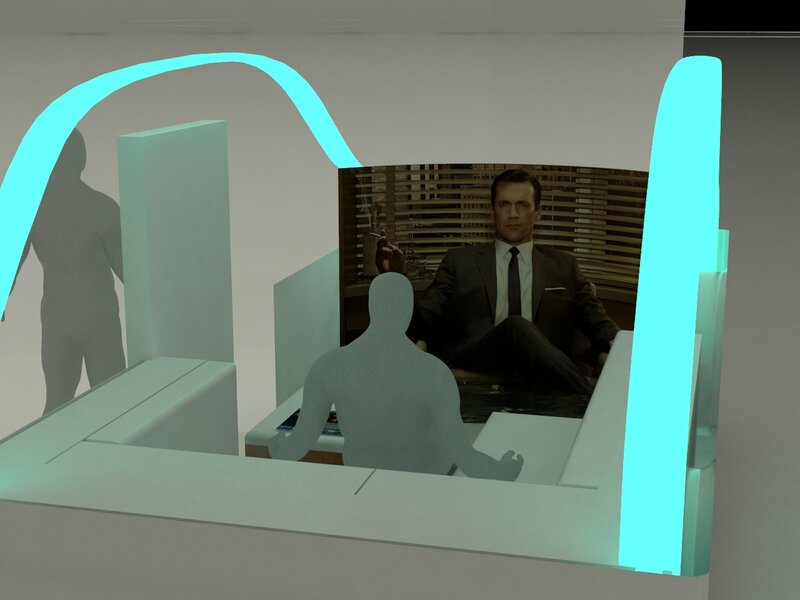 Various security and fit features were proposed to be built into the frame, including a fingerprint-recognition based lock to deter theft. The most interesting and practical feature was slot in the frame crossbar where riders can stash laptop computers. Personally, I am pretty partial to the old-fashioned bicycle… but I like the idea of built-ins and plug-ins that would make for ease of use and deterrence of theft. I am not running any images of this because the students stated that they are going to try to make their smart phone app design project into a real-life product. Tan and Ahmed have an interesting app proposal, though. Using social network connections, users can offer or seek shared rides in private cars. Drivers offering rides could see requests that fall on the way to their destination. The app would suggest convenient pick-up locations, including, in some cases, directing the ride requester to walk a few blocks. Once the shared ride is underway, the passenger checks in, enabling tracking. One of the interesting features that they proposed would be to use member-destinations (think churches, schools, gyms, workplaces, and the like) to assist in matching. If I am going driving to my church, I can interact with other users who have identified themselves as members for that destination. Marketing could be directed toward the member-destination institutions themselves. Users receive points for participation. Points yield rankings, which give users bragging status like “I’m the number one carpooler in my church” and points can be cashed in for prizes, paid for through advertising on the site. I think, in the long run (and as liability issues are resolved) there should be an AirBNB-type ap for cars. I’ve heard of some of these for things like SF parking spaces, but, dear Southern California readers, anybody have one that’s up and running that you use for carpooling? Want to write a review of it for SBLA? Any venture capitalists out there want to help Danial and Andrew with their app start-up? A few different teams looked at how transit benches could be more interesting, more beautiful, more green and more multi-functional. I like the idea of beautiful artwork also being a place to sit. I am a fan of artist Horace Washington’s giant spools of thread seating at at the Metro Blue Line Vernon Station and artist Richard Turner’s 1950s-style-inspired seating at the Metro Green Line Aviation Station.While the student designs are handsome, I am not sure that these benches look quite “bomb-proof” enough to withstand L.A.’s public realm. They will be subject to scratchitti, graffiti, and just the steady stream of Metro riders. I also tend to want benches to be fairly low-cost, because, as Daniel Jacobson pointed out in yesterday’s editorial, there are plenty of heavily-used Metro bus stops with no seating at all. As readers might imagine, these undergraduate students are expecting to see “V2V” driverless cars on the roads soon. Or at least in their lifetime. I would counter that, as pointed out by researcher Steven Shladover at the recent Digital Cities Smarter Transportation conference, driverless technology has been right around the corner since the late 1930s… and still appears to be a few years off. Unless you count my personal driverless solution. 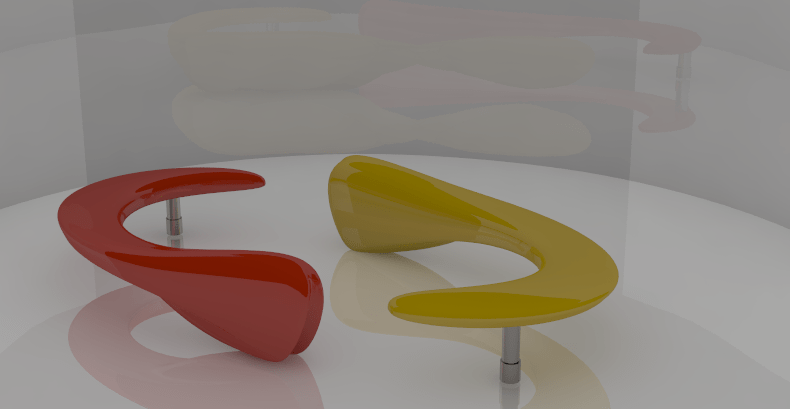 Nonetheless, it’s an interesting design question. Assume that driverless technology works unerringly. Than you’re moving down the road, paying no attention to the road. Would you really want to sit inside today’s cramped car interior? This team had seen images from driverless car prototypes that still look just like current car interiors. So, instead they came up with a car interior that resembles a living room couch, complete with wide-screen television. Their designs include a lot of tucked-in features like cabinets, so that it feels a bit like interior of small houseboat. It’s difficult for me, a digital immigrant bicyclist, to imagine how driverless cars might change our streets and our vehicles. I wonder though if the shape of the car itself will remain. Will it become something more aerodynamic, maybe like a missile or a sphere? Will energy be at a premium, so the materials would need to become as light as possible? Let’s close with this image, which was included in Zeolla and Tonyan’s presentation, and also available widely on the web, including here at Paleofuture. 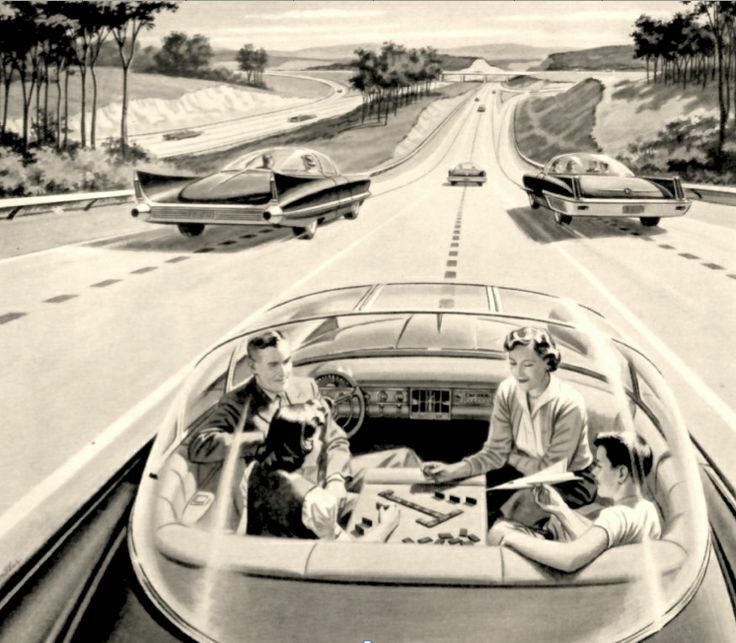 It’s a hopeful 1950s-era look at that same driverless car interior. What the driverless car used to look like, back in the 1957. For full advertisement see Paleofuture. Is Relay Rides the AirBnb for cars you’re looking for? LYFT has been hinting that they will be axding features to capture more on the fly car sharing rather than being just an amateur taxi system enabler. Public Health Student Stephanie Hopp: With a Growing Effort Toward Safe Routes to Schools, Why Not Safe Routes to Universities? How Quickly Will Caltrans Embrace Complete Streets Policies?